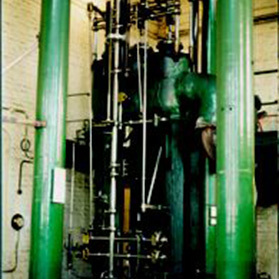 The Boulton and Watt engine was built in 1820 and moved to Kew Bridge from the Grand Junction Waterworks Company's Chelsea works in 1840. Originally there were two engines installed in this building, but the “East Cornish” engine was removed in the 1940s to allow artefacts from other pumping stations to be displayed here, as part of the Metropolitan Water Board museum. The Boulton & Watt is the oldest engine on site and ceased working in 1943 before being restored to working order in 1975. The sump of this engine has proved popular with wildlife with fish and crabs making their homes there. The engine was built by Boulton & Watt of the Soho Foundry, Birmingham in 1820, the year after the death of James Watt. In 1848 it was converted to work on the Cornish cycle, using higher pressure steam.